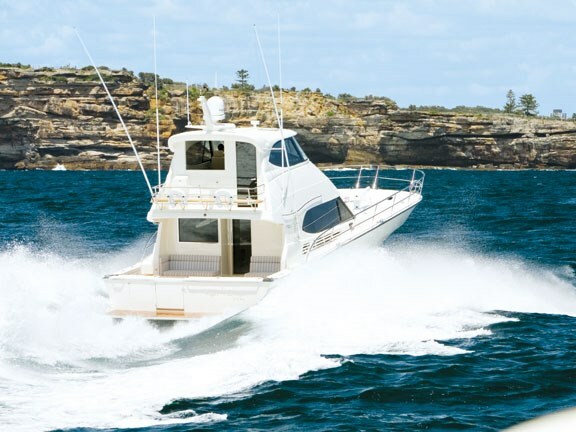 Purpose-built for adventure boating, Formula’s eighth Icon 54, Karizma, boasts twin 825hp MTU Series 60 engines so you can run hard and fast at sea, and at night, heavy-duty anchoring gear – a 63kg plough and 100m of 12mm chain – keep you safe. As with most boat builders, Formula has continued to evolve the Icon 54. "A lot of the changes are subtle improvements on what we know works from our previous boats," says Troy Woods, Formula’s sales and marketing manager, "but taken as a whole they are significant. Karizma would be without doubt the most cruising orientated Icon 54 we have built to date and most areas onboard have undergone some degree of change to better reflect the owner’s plans for the boat." It usually takes about 24,000 man-hours to build an Icon 54. Karizma is built to survey standards, with a solid (2.5cm thick) fibreglass hull below the waterline and vacuum-bagged Corecell foam-cored sides and decks. 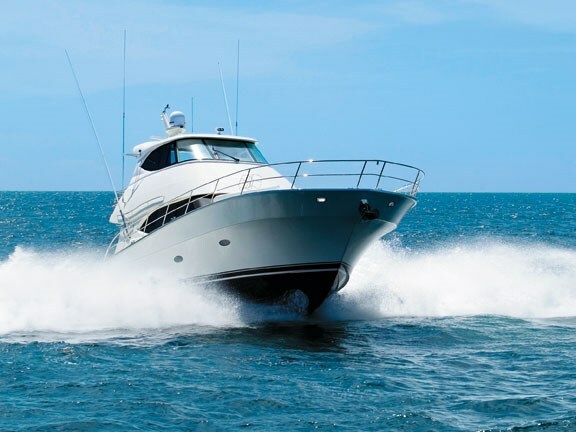 The hull is a warped-plane design with variable deadrise from a sharp 58-degree entry at its forefoot to 21 degrees of deep-vee just ahead of the engines to a relatively flat 10 degrees at the transom. Efficiency is generated by the flat run aft and the low 7.9-degree shaft angles, as is stability. In reverse, the boat scoots back without digging in like a traditional deep-vee; this endears it to gamefishing. With a 2.16m of freeboard in the huge flared bow you can travel at displacement speeds – or troll all day into a headsea – without shipping water. Compared with other locally made cruisers around the same length, the Icon 54 is wider but lighter, displacing about 30,000kg loaded. 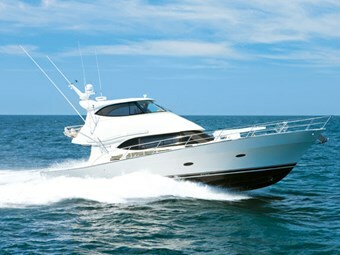 The boat is backed by a 10-year warranty. The Formula 54’s foredeck features a beefed-up anchoring arrangement, with provision to fit a bridle, a 500kg Davco davit, Nautica tender and liferaft, with plenty of floor space left over. There’s wide walk-around decks, a high bowrail reaching well aft, new moulded steps in the cockpit, and survey-height coamings. Among the other new features are frameless glass windows, smart engine vents high-up on the superstructure sides, and a two-pack painted hull. The high quality, heavy-duty stainless steel rails, aft rocket launcher, and outriggers point to the offshore intent. 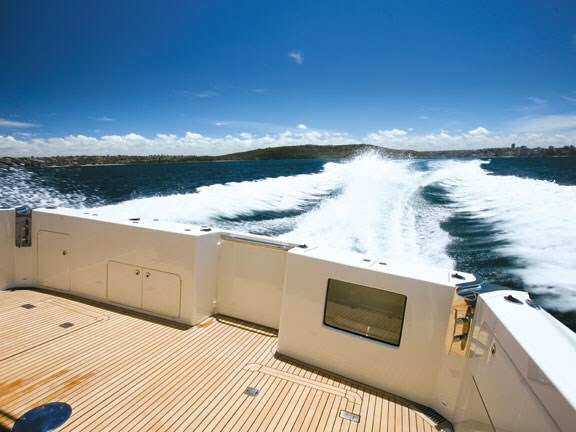 There are concealed gaff racks, a walk-in rod locker for hose-down tackle cleaning, 200L-plus in-transom livebait bin, big outward opening marlin door, and heavy duty hawsepipes, plus aft-facing lounges under the moulded overhang (200L freezer contained underneath) and twin teak tables for up to eight people. Dive tank storage is included. The high-gloss cherrywood joinery, buff headliners and beige carpets create a livable interior with the right amount of luxury and serviceability. The fit and finish are hard to fault, and the internal staircase wends up to the cruising-oriented flying bridge. 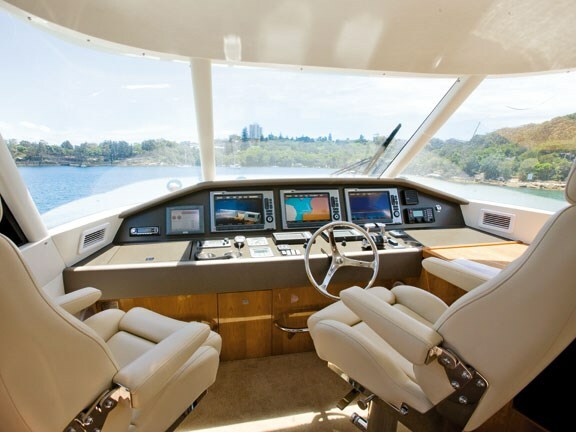 Karizma has a new, fully enclosed and air-conditioned flybridge with a forward helm position and full aft bulkhead complete with electric drop-down window. A second outdoor docking station on the bridgedeck, which has seating for four, assists with manoeuvring at the marina. There were also bow and stern thrusters. The twin helm seats offer great views forward, a bow camera monitors anchor retrieval, and a big spread of Raymarine electronics assist navigation. 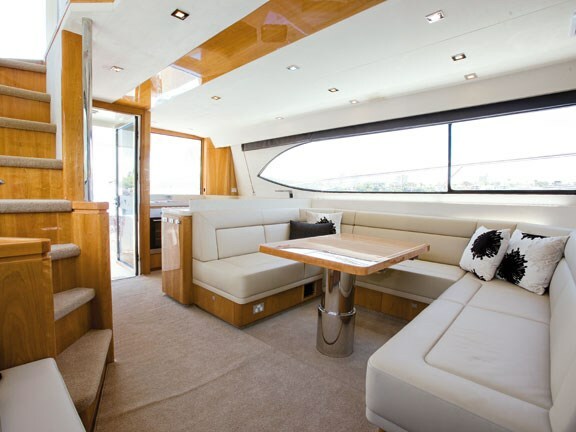 The L-shaped flybridge settee converts into a double bed, in effect creating a private fourth cabin. A fridge is nearby, while the lighting plans include underwater lights. 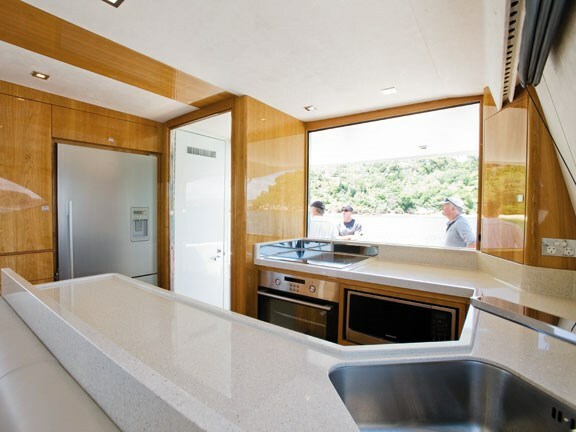 Back down in the saloon, the aft galley is ideally located for feeding the family outdoors via the electric window, when not flipping a steak on the electric barbie. Appliances range from four-burner cooktop, oven and grill, and convection microwave to dishwasher and oversized fridge and freezer with ice and water dispenser. There’s abundant storage space, Corian counters, soft-close drawers and a built-in wetbar. The AC/DC control panel now features BEP (NZ-made) C-Bus switching on a touch-screen display. The U-shaped lounge to port can seat eight people around a dinette/coffee table, but the electric pedestal converts this dinette into another double bed. A two-person lounge is opposite and all seating enjoys good views of the TV in the forward cabinet. 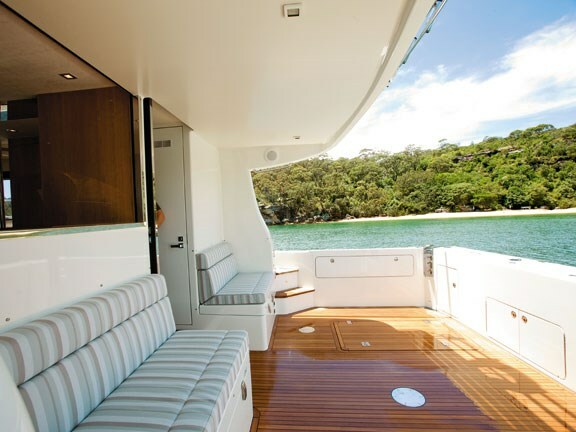 With the generator and air running, noise levels were pleasantly low – the boat’s engines have underwater exhausts – while a 4000W inverter lets you run the AV in silent-ship mode, too. Down the companionway is a roomy three-cabin and two-head layout. The starboard-side cabin has crossover bunks, the VIP cabin up front features an island berth and there’s a shared en suite. 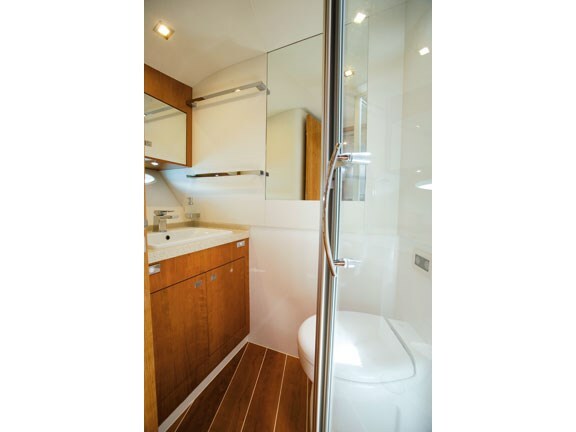 The owners’ stateroom amidships to port boasts an island berth and en suite with man-sized shower and Tecma head. 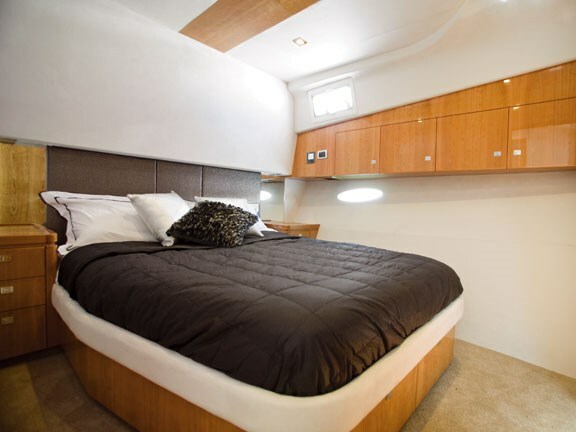 All told, there’s comfortable sleeping for up to 10 people in three cabins, the saloon and flybridge. But that’s not to say the boat isn’t setup for game fishing. Karizma has a huge, dedicated, security alarmed rod locker, concealed gaff and tag pole lockers, Reelax gamechair, large cockpit freezer, live-bait tanks, and Raymarine electronics package with 3kW and 1kW deep-water depthsounders, and high-definition digital radar. 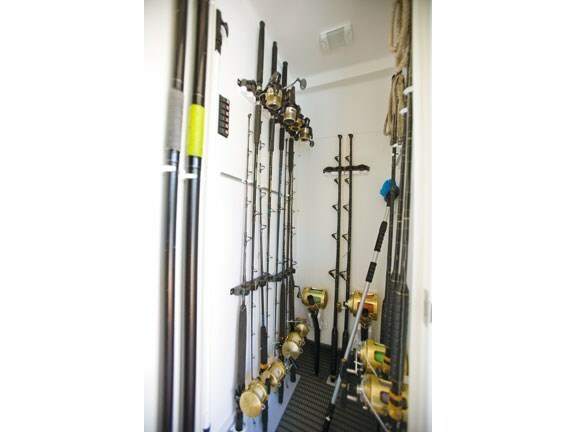 Servicing room is excellent around the MTUs in their fan-assisted, watertight engineroom and the 17kW Kohler generator in the aft engineering space, where you’ll also find a washer-dryer. With 4000L of fuel, you can really go places, aided by the 1000L of water and the FCI watermaker. Offshore, the stiff and strong warped-plane Formula hull cuts a real swathe. 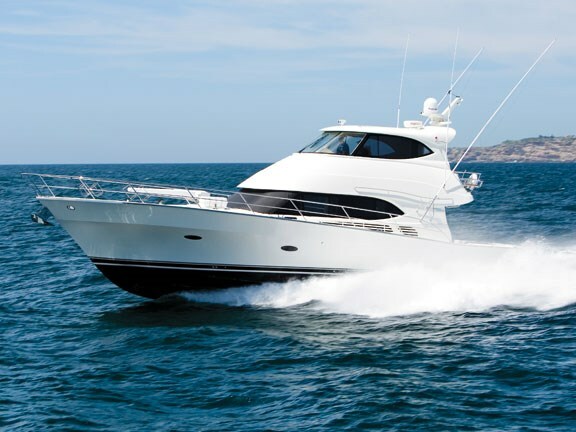 The twin MTU 825hp engines give a top speed of over 32kts with comfortable cruising speed of 26kts, which is fast for a 54-footer. At 20kts, the save working range is more than 500 nautical miles and at 10kts it’s almost twice that. The ride feels great and, although a lot of water is thrown about, the Carolina flare throws it out. And in the hardtop, you only need switch the wipers and turn-up the air-con. See a range of Formula boats for sale.